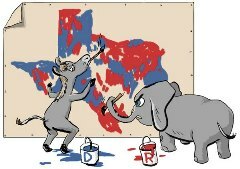 Where Do I Vote in Texas? 2012 Voting Day Information - Let's Run Up the Score! As I have said for weeks now, this election is not about winning, it's about sending a message to Washington D.C. and to Austin, Texas. No more big government. No more big spending. No more abuse of government processes to redistribute wealth. Last night, former Harris County Tax Assessor, Paul Bettencourt said it best proclaiming that "in Texas it's not just about winning, it's about running up the score!" Today is your best opportunity to do that by getting out to vote and taking ten of your like-minded friends with you. Following is some information you will find helpful if you are not sure where you polling location is. Even if you think you know where your polling place is, it is best to check. Because of redistricting, many voting locations have changed. And if you think your vote doesn't matter, just listen to these two judges in Harris County. Judge Tad Halbach won his election by just 230 votes out of over 1 million votes cast. Judge Brock Thomas was unseated by an unqualified Democrat Judge in a very tight race because of straight ticket Democrat voting in the Obama sweep.Your vote matters! Vote today and then talk to your friends and neighbors. Get them to the polls. Find every like-minded registered voter you can and make sure they vote. Some of these races may well be decided by just a few votes. Make sure you don't leave any votes at home that could have made the difference.